Today I realized that nothing makes me happier than a perfect song transition on the radio. Listening to radioparadise.com while on my morning jog, they played Gotye's "Smoke and Mirrors" followed by Marvin Gaye's "Inner City Blues". It wasn't until I heard the smooth vocalizations of Mr. Gaye that I realized a new song was playing. The seamless transition between the two songs gave me chills. It makes me happy to realize that the owners of my favourite radio station care enough about their listeners to take the time to put some thought in to their playlists. The same outcome I strive for when I make a mix tape - or CD. 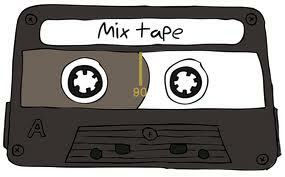 Any true music lover will agree that the time and effort that goes into the creation of a mix tape is a covert illustration of their love; be it for the person you give the mix to or the love you have for the songs. I learned all about mix tape manufacturing back when I was in college. I had a secret crush on my best (boy) friend. He showed me the ropes so to speak. He owned the stereo equipment and he gave me the technical skills to create a mix tape. I owe him for that. But ultimately, the secret to my success as a mix tape artist, is the joy I derive from music and the outpouring of my heart into the mix.